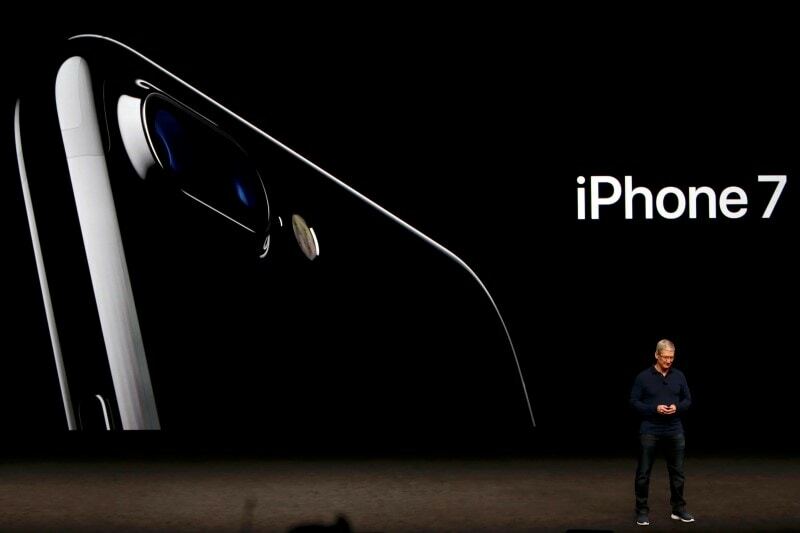 Apple has unveiled the iPhone 7 and iPhone 7 Plus at a special event in San Francisco. The latest iPhone models comes with a new design, doing away with the antenna lines, and they will be available in two new colours: (matte) black, jet (glossy) black, in addition to gold, silver, and rose gold, seen earlier. The iPhone 7 starts at $649 (approximately Rs. 43,000) for 32GB variant, doing away with the 16GB variant, while the iPhone 7 Plus start at $769 (Rs. 51,000), with a $100 premium for the next storage variants for both models: 128GB and 256GB. Pre-orders open this Friday and the new iPhone models will ship on September 13 in select countries. No word yet on India launch price and date. The iPhone 7 and iPhone 7 Plus also feature a redesigned home button, and pack in dust and water resistance, a first for the iPhone series. There are camera improvements, with the iPhone 7 also getting optical image stabilisation (OIS). There’s a new 6-element f/1.8 aperture lens with 12-megapixel sensor and quad-LED with True Tone Flash. A new 7-megapixel front camera is included as well. The newest iPhone models come with a new image processing image, which, Apple claims, delivers better, faster pictures. The iPhone 7 Plus packs in the widely rumoured dual rear camera setup – one 56mm telephoto lens and the other wide-angle lens. The bigger iPhone is also capable of 2X optical zoom, with total zoom up to 10x. The new iPhone models comes with a 25 percent brighter display with a wider colour gambit and improved colour management. The iPhone 7 and iPhone 7 Plus are powered by a new A10 Fusion 64-bit quad core chip, which is 40 percent faster than the A9, and more power efficient, which means the new models have the “best battery life ever” on an iPhone. The speakers in iPhone 7 and iPhone 7 Plus are stereo – one at the bottom, and one at the top, and twice as loud as their predecessors. As expected, the iPhone 7 and iPhone 7 Plus also ditch the headphone jack, which means your existing earphones will not work with the new iPhone models. Apple will use the Lightning port for audio. Each new iPhone model will come with bundled Lightning EarPods, and a Lightning-to-3.5mm audio adapter. Apple also introduced new AirPods for wireless audio experience, which will not be bundled with the iPhone models. They pair easily with your Apple devices, thanks to the W1 chip inside Apple devices. They are rated to delivery 5 hours of battery life, up to 24 hours with the included charging case that is also used for carrying them around.